We've been lucky enough to paddle several places outside of North Carolina So far we've taken Nessie to Virginia, Pennsylvania, Massachusetts, New Hampshire, Vermont, Maine, Wyoming, and Montana. We plan to add to the list soon. Here are some of the places we've taken Nessie. Paddling Jenny Lake In September 2008 we made a tip west to paddle in Glacier and Grand Teton National Parks. This is the page on about our paddle on Jenny Lake in Grand Teton National Park. For more about the trip west see trip west. Paddling Bowman Lake Glacier National Park. 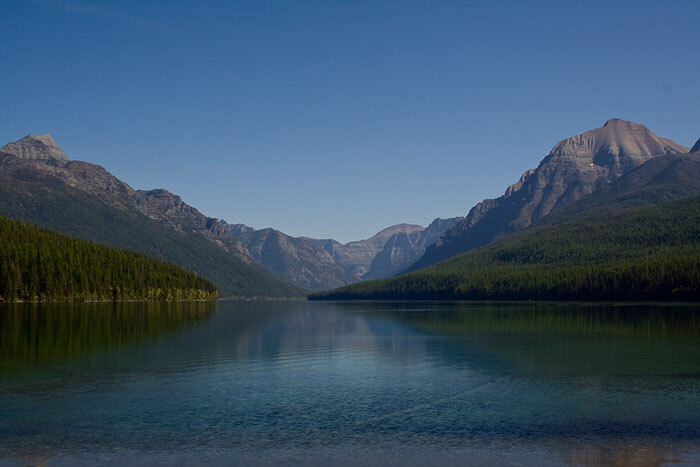 This page is about our paddle on Bowman Lake in Glacier National Park. This is about as remote a location you can find. Paddling Swiftcurrent Lake Glacier National Park Another paddle in Glacier National Park part of our trip west. Paddling Acadia National Park. 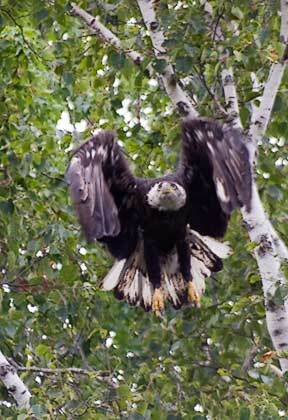 The highlight of our paddling in Acadia was a show by three eagles. It was something to see. Paddling Massachusetts. Covers three ponds in the Berkshires of Massachusetts. These were nice quite paddles. Shagger's Inn Pennsylvania 2006 In September 2006 we made a trek to the Pennsylvania Wilds (that's really a region of Pennsylvania). The attractions were several places to paddle and a chance to see one of the major elk herds in the eastern US. Several individual trips from this trip are covered on the website. Travels with Nessie Home :: Site Map:: Contact webmaster@ncsparks.com-email us:: Copyright Leslie Sparks 2006, 2007, 2008, 2009, 2010, 2011, 2012,2013,2019:: Last modified: February 24 2011.